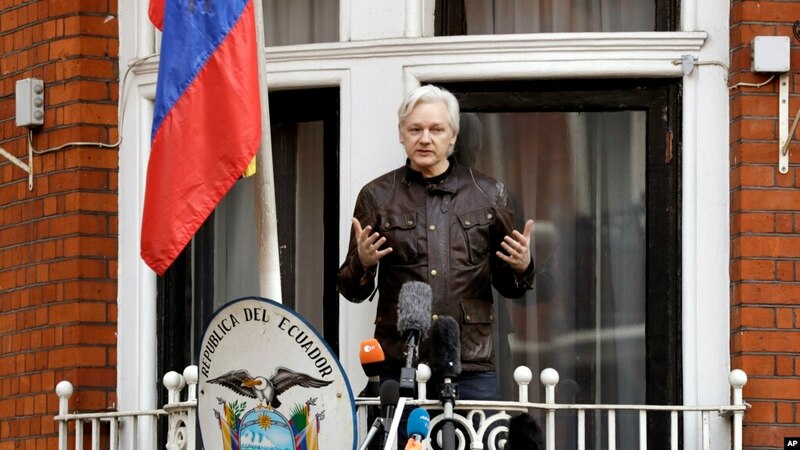 WikiLeaks founder Julian Assange gestures as he speaks on the balcony of the Ecuadorian embassy, in London, May 19, 2017. For six years, Julian Assange, founder of WikiLeaks, has lived at the Embassy of Ecuador in London. He took refuge there in 2012 to avoid being extradited to Sweden, where he was wanted for questioning in a sexual assault investigation. ​The Swedish probe has been dropped. But, Assange has other probliems. He is wanted in the United States, where federal prosecutors are investigating WikiLeaks. Assange could get extradited there if his luck runs out. 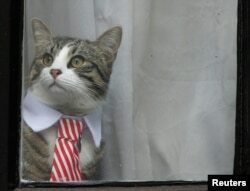 FILE – Julian Assange’s cat sits at the window of Ecuador’s embassy in London, Britain, Nov. 14, 2016. Julian Assange seems to think that Ecuador wants to end his asylum at their embassy. He says that Ecuador has put increasing pressure on him to leave. How? By asking him to pay for his own medical bills. And to take better care of his cat – well, actually the cat’s little messes. Apparently for Julian Assange, Ecuador was asking for too much. He got in touch with the Inter-American Commission on Human Rights. And he registered a complaint against Ecuador and its embassy. The Inter-American Commission on Human Rights.​rejected Assange’s complaint. They did however remind Ecuador that it’s illegal to extradite a person to a country where their human rights might be abused.